70 acoustic lessons in 4 seperate packs, including a JamTrack Pack. 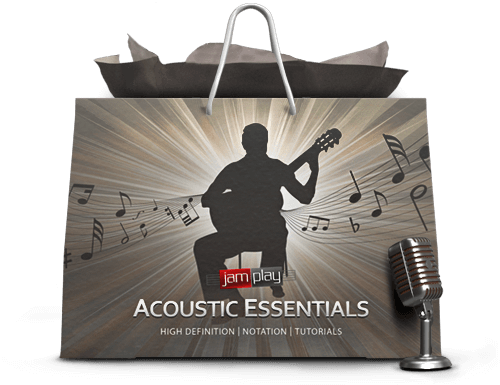 Exclusive "Acoustic Starter" JamTrack Pack included in this Bundle. If you want to take your chord playing and songwriting to the next level you are going to want this course. You will learn very easy variations on chords you already know that allow you to spice up progressions and create melody within them. Then we will look at how you can use all of these techniques in some of the world's most popular chord progressions. The goal here is to show you how to take a few basic chords and expand greatly expand their sound. This will give you exciting ways to freshen up stale chords. Then you will put those chords into common chord progressions that are used in many popular songs. This will give you immediate context as you learn and implement the chords into your playing. You will learn the most common fingerings for Major and Minor chords and their variations. Then over 6 lessons you will learn to play these chords in popular progressions. Learn 20 of the most impactful strumming patterns for acoustic guitar. We will explore basic rhythms in the styles of rock, bluegrass, jazz, and country to create a focused practice plan. From simple rock rhythms to the basic waltz, receive 20 lessons in 1080p quality complete with tabs, notation and Master PDF. The goal is to get you comfortable with various styles and strumming patterns, which will open new doors for playing in different styles and timings. Right hand technique and rhythm effeciency define your playing, as it can be thought of as the "driver" of the instrument. Learn the "essential" rhythms to unlock new songs, genres and timings. 20 strumming patterns to learn and perfect, with the goal of your expanding your comfort zone, timing and song styles. Ideas in rock, country, jazz and more. Does fingerstyle scare the crap out of you? Everyone has been there. Sam Pacetti will lay the foundation to help you overcome the initial hurdles of fingerstyle technique, beginning with the thumb then expanding to all fingers. We then expand to Travis Picking and playing simple arpeggios to tie everything together. This pack contains 20 exclusive lessons in 1080p with full tabs and notation. If you are just getting started with fingerstyle, or have some experience with "gaps" in your ability, this pack is for you. The purpose is to build a foundation of reliable technique to expand on in the future. Make 2018 the year where you finally become comfortable with fingerstyle technique, as this pack is intended to lay the ground work for future growth as a player. 20 starter fingerstyle patterns, beginning at the ground-floor of the technique. We start with the thumb, then slowly add more fingers as you become comfortable. If you’re just starting out on your guitar journey, sometimes it can be challenging to know what genres you’re interested in learning. We all have things that we know and love, but it can be both fun and rewarding to discover and learn a genre we’re not familiar with. If this sounds like you, this is a great pack to start with. Each track includes a helpful Guide Track MP3 with narration covering important points to practice. These tracks are specifically geared towards beginning players, incorporating simple rhythms and easy chord progressions. Play along with 20 unique tracks across a diverse range of styles, all featuring pro session musicians and full, easy-to-follow lead charts. If you’re looking to take your practice sessions to the next level for years to come, look no further! Select the Acoustic Essentials at checkout and get it for free. Own it for life. Limited Time only.